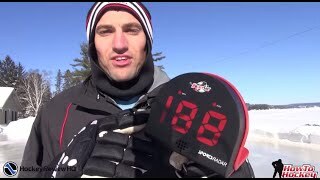 Keep tabs on the growing strength of your shot with HockeyShot’s Extreme Radar Gun. It accurately measures speeds up to 199 km/h and stores the last 10 readings so you can monitor your progress as you train. If you’re serious about becoming a sniper, start by tracking the strength of your shot. Nothing makes that easier or more affordable to do than HockeyShot’s Extreme Radar! It’s easy to set up and easy to see as you train your howitzer. It even has audio functionality if you’d prefer to leave your head down and keep firing. Large red 5.4 cm 3-digit LED display, can be seen easily from a distance. Speed range: 5 km/h to 199 km/h. Speed recall feature allows you to see the last 10 recorded speeds. Speaker to announce the reading speed. Distance range: up to 9.1 meters. Adjustable tripod for set-up anywhere and a more accurate speed reading. "Every good coach knows the key to improvement is timely, constructive feedback of a player's performance. This isn't always possible when a player is working on skills on their own... until now! Hockeyshot's Extreme Radar allows players to see their improvement in shot power first hand from accurate and timely speed readings! Players can set goals based on this feedback in order to kick their shot power up a couple of km's or miles based on their progress. Empower any power today with the ability to self-coach with the Hockeyshot's Extreme Radar product for their at home or on ice development sessions!" "HockeyShot's Extreme Radar is portable, flexible, and (most importantly) accurate. The unit readings are right in line with the units selling for 10x the price. We love the functionality of being able to switch between mph and kph depending on where we are doing our training. HockeyShot made the most enjoyable element of training simple and affordable with their Extreme Radar! " Kids loved this on the ice. Lots of fun. Très efficace! Beaucoup de plaisir! Kids love it. Always trying to beat their high score. Used it for kids skill completion and they really like it ! Good product, my boys have fun with it. My kids think this is super cool. I also use it at hockey practice. The kids have a blast seeing how hard they can shot. Fast delivery and awesome product. It is always fun to shoot and see your speed, but the radar is wildly inconsistent. Best training aids in the hockey biz! Easy to set up, although the tripod seems a little low.